York Lo’s recent article, J.H. Vaughan – An American Shipbuilder in Hong Kong, mentions that the yard built the replica of the USS San Pablo for the well known film The Sand Pebbles. When the late Richard McKenna’s first and only novel, “The Sand Pebbles,” was published in 1962 (New York, Harper & Row) critics praised its “thundering action” and “flesh and blood characters.” They also took special note of the newness of the subject – adventure aboard a Yangtze River gunboat, the USS San Pablo, at the very moment of China’s bloody awakening to its new destiny. Now, “The Sand Pebbles,” twenty-eight weeks on the New York Times best-seller list, a $10,000 Harper’s Prize Novel and serialized in the Saturday Evening Post, America’s most distinguished general readership magazine, has been made into a major motion picture for 20th Century-Fox road show release. Location filming began in mid November, 1965, when Wise led a Hollywood cast and crew numbering more than one hundred to Keelung, Tam Sui and Taipei on the island of Taiwan, for initial photography. An additional location in Hong Kong followed with a final two months of production at the 20th Century-Fox studio in Beverly Hills, California. “The Sand Pebbles” was photographed spectacularly in Deluxe Color and Panavision by veteran cinematographer Joe MacDonald, who took full advantage of the overwhelming scenery of the Orient. Taiwan (Formosa): As filming of “The Sand Pebbles” in Hunan Province, Mainland China, was an impossibility, old China and the Yangtze were recreated on the island of Taiwan and in Hong Kong. The production began on the rainy morning of November 22, 1965, in the port of Keelung. Here, the Shanghai Bund, as it appeared in 1926, was fashioned by production designer Boris Leven. One of the largest “shots” of the film, it covered an area of two square miles and called for one thousand extras, one hundred sampans, fourteen junks and period shipping in the harbor. The next location was on a Taiwan military base, “8-Foot Gate,” near Keelung. It was at this point that the cast of “The Sand Pebbles” met the “star” of the picture–the USS San Pablo. The gunboat, built in Hong Kong, was brought to Taiwan for four and one-half months of filming. “8-Foot Gate” represented a berth at Hankow. While “The Sand Pebbles” was filmed at various places within the near vicinity of Taipei — where rice paddies abound and the countryside resembles Old China — main filming was done at the village of Tam Sui, on the river of the same name, which opens to the Formosan Straits. Tam Sui, representing “Changsha,” was home for the company for more than three months. The gunboat was a permanent resident and departed for mid-river work three or four mornings a week. Also in the Tam Sui area was “Paoshan,” where one of the most gripping moments of “The Sand Pebbles” was filmed — The Death of a Thousand Cuts. The area of Tam Sui, a fishing town of 5,000 souls, was chosen because of its similarity to Hunan Province. It bears remarkable likeness, according to many former mainlanders. Filming was also accomplished in the narrow, crowded streets of Taipei. Under difficult conditions, a typical Shanghai street was filmed. Another set was on heavily-travelled Di Hwa Street in the heart of Taipei. Location work on Taiwan was finished March 21, 1966. Hong Kong: The back waters of Hong Kong and its green islands served as deeper water areas of the Yangtze; its waterfront also was changed at the Fire Brigade Dock to represent Hankow Bund. The company filmed on the edge of Red China for a period of two months, culminating with the battle staged in a narrow neck of water at Sai Kung. The “junk fight” at Sai Kung, wherein the USS San Pablo is faced with a blockade, is one of the most unusual sea battles ever staged. In the 1800’s and through the early 1900’s, river pirates sometimes blocked off waters with an array of junks bound together by a heavy bamboo rope. The opposing forces in “The Sand Pebbles” used this technique to blockade the gunboat. The battle alone took two months of preparation and the 1,000-foot bamboo rope which linked the junks together weighed twenty-five tons. Battle filming by the First Unit, lasted a month in Sai Kung waters. First Unit work was completed May 15, 1966. Studio: Sets in the studio included the San Pablo’s steam engine; a brothel, “The Red Candle Happiness Gardens”: and the story’s mission, constructed on a half-acre at the Fox ranch at Malibu and fashioned after a Buddhist temple which still exists on the Chinese Mainland. But perhaps the real star of the film is a 150-foot steel-hulled gunboat, built by Vaughn & Yung Engineering Ltd. of Hong Kong. The San Pablo herself, river-going “home” of “The Sand Pebbles.” An authentic replica of one type of U.S. navy gunboat used in China in the 1920’s, the current San Pablo is powered with a diesel engine, will “sleep” a caretaker crew of six and is an ocean-going vessel capable of ten knots. She made the voyage by sea from Hong Kong to Taiwan and then back to Hong Kong, attesting to her stability. Other shipping requirements for “The Sand Pebbles” included two old freight ships, one passenger river streamer, ten Chinese junks, one hundred sampans, a whale boat and twenty wupans. 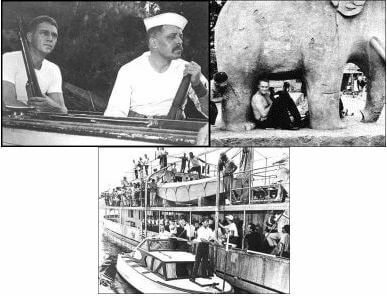 The biggest talent search ever staged by Hollywood was in connection with “The Sand Pebbles.” A working steam engine, the San Pablo’s hot driving force, weighing 41,280 pounds and of the 1926 vintage, was finally found in Vancouver, British Columbia. It was aboard a fifty-year old Norwegian whaler on its way to the scrap-yard. “The Sand Pebbles” was the first major American motion picture ever to be made on Taiwan. There is a small film industry on the island and Chinese films have been produced for some twenty years. Prior to that, Japanese films were sometimes made on Formosa. Technically, Taiwan is at war! Therefore, the cast and crew of “The Sand Pebbles” were under military jurisdiction much of the time. Several locations were in military areas. It went a bit beyond technicality, too. Red Chinese jet over-flights were weekly occurrences and, every two days, the off-shore islands of Matsu and Quemoy were bombarded. Cast and crew of “The Sand Pebbles” received more than 900 inoculations prior to receiving health clearances for entry into Taiwan. Since Thanksgiving, Christmas and New Years were spent on Taiwan, and Easter in Hong Kong, more than one hundred dependents of cast and crew joined the film colony on location. They ranged in size from Steve McQueen’s family of six to assistant director Reggie Callow’s family of one – his son Allan, who was assistant to Reggie. He was a working dependent! A bit about the island of Taiwan, named by Portuguese mariners in the 16th Century, Ilha Formosa (Beautiful Island), The climate approximates that of Cuba. So does the vegetation. The official Chinese language is Mandarin, although almost everyone over thirty also speaks Japanese, since Taiwan was under occupation from 1895 to 1945. The total population is about 11,000,000 and all but one-quarter million are Chinese. About the size of Massachusetts and Connecticut combined, it is 240 miles in length and 85 miles in width. Cast and crew weathered a few storms of various natures – including the wet kind – during the making of the film. One night in Taiwan the entire city swayed in a major earthquake; the following night a hotel housing many of the crew caught on fire; in Hong Kong cast and crew were interested and disturbed by-standers during three days of rioting. Producer-director Wise was at sea on the gunboat San Pablo when word was radioed that he’d won “best direction” at the 1966 Academy Awards. Event was celebrated Chinese style with fire-crackers and a dragon dance. “The Sound of Music,” of course, also received “best picture” as well as technical awards. The gunboat had a varied history. She crossed the Formosan Straits in a storm and was overdue by a day while an anxious company awaited her arrival. In her period as a prime action prop, she ran aground numerous times in the shallow Tam Sui River. In Hong Kong waters, she was deliberately set afire. In total, she was completely repainted eleven times during the course of filming. On the long location one actor, Joe di Reda, became a father; there was a wedding aboard the San Pablo – make-up man Bill Turner marrying Japanese dancer Kaoru Nara. Wives and families shuttled back and forth to the Orient – several visiting location twice. This article was first posted on 2nd November 2016.